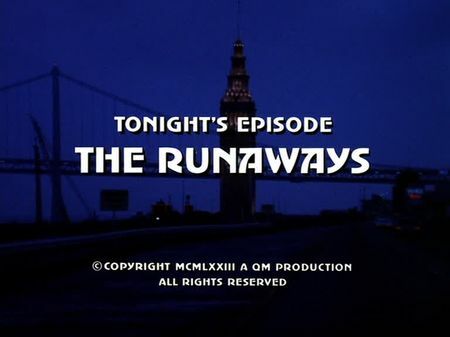 The screencaps for The Runaways are now accessible though the episodes' page. Three young runaways from Oregon, George, Jack and Sharon Morgan are squatting in a condemned house in San Francisco. Sharon, the youngest of the three, is very sick, but they got no money for medicine and the oldest brother, George, does not want to take her for hospital treatment in fear of juvenile court and (another) split-up of the family. Instead, he decides to break into a local pharmacy after hours, collecting several antibiotics and cough medicine. Surprised by the pharmacist who suddenly appears in the back door and immediately fires a gun on him, George tries to escape through the front door. The pharmacist, however, blocks the way, and when George hustles him the owners' back of the head strikes an edge of the door while falling onto the ground. George tries to look after the conciousless man, but when he recognizes the police siren coming closer, he immediately collects the gun and runs away - well observed by a newspaper boy who is preparing his next delivery at the opposite corner. Following the information given by the newspaper boy, Mike and Steve take care of the younger brother Jack and Sharon, who is immediately taken to hospital. In the first instance, George's predictions seem to come true: Mike calls the juvenile court - what he has to do - but apart from his initial doubts, Jack quickly realises that assigned Judge Millie Cox, a warm-hearted caretaker of orphans, could be different. Meanwhile, George makes a bad decision: he decides to take the judge hostage when she invites his brother for lunch although Jack tries to convince him this would be a fatal error. Mike and Steve, together with Millie Cox's husband (the two are good friends of Mike for decades, and we learn that Mike would have married her if he had not met his deceased love), need to hurry before George comes to another fatal decision. This episode's first location is a condemned house which is no longer existing. It was located in the Western Addition, adjacent to the McAllister and Octavia Streets intersection, and was demolished under the City's housing project in the 1970's. George Morgan breaks into a local pharmacy in North Beach, at the corner of Stockton and Filbert, which is the northeastern border of famous Washington Square. Hospital indoor scenes were probably taken at SF General Hospital, and we are introduced to Judge Millie Cox who is entering SF City Hall (external view) but actually enters the Criminal Courts and SFPD headquarters building (interior views) on Bryant Street. She later takes Jack Morgan to the 'House of Pancakes' which is no longer existing as a business, but the building at Lomabrd & Pierce is still there, including the parking lot where George takes her hostage. The two brothers take her to the Southern Windmill of Golden Gate Park which was broken-up later but rebuilt again in 2011. Mike is being called to the waterfront where Millie Cox's car was left behind close to Pier 34, whereas George gives him a call using a telephone booth on 16th Street, just south of Market Street (you can see Mission Dolores Basilica in the background), giving advice for the handover of his younger sister, Sharon. Police sets a trap at that location, i.e. former Southern Pacific railway depot at 3rd and Townsend. The historical building, erected in 1915, was closed and demolished just two years after this episode was filmed, and on the following chase Jack as well as Mike pass right through the construction site of the station that later replaced 3rd and Townsend depot, located across the street at 4th and Townsend, and opened for operation in 1975.